No matter the size of the meeting, conference or event you are organizing, there is a lot that goes into making it successful. While most event attendees are not aware of the half of it, as an event manager, you know there are many different aspects involved in pulling off a successful event. The pre-event calculating, planning, selecting and organizing, of the venue, food and beverages, staff, speakers, attendees, signage, sound and multimedia systems including other elements can be challenging. Making sure the execution of all those elements goes off without a hitch, even more so. Part and parcel in achieving your primary goal of client satisfaction is attendee satisfaction. All attendees, regardless of whether they speak and understand English or not, should enjoy a great experience. Providing interpretation services is essential so that limited English speaking attendees can experience and understand the event in their first language. Interpreting services are a valuable and worthwhile investment to any project. While it can be tempting to save money by opting out of these services, ironically, this can end up being a costly decision. Potential attendees who do not speak English as their first language may also opt out of the event where interpreting services are not made available. In other words, they may choose not to attend. Not only that, but, if they do attend but have a less than positive experience, they may not support the goods and services being positioned at the event, resulting in missed revenue opportunities. On the other hand, in addition to boosted attendance, having interpreters at your event can actually end up being profitable in the long run. As the catchphrase states, sometimes you gotta’ spend money to make money. Greater numbers can lead to more potential clients and business opportunities. 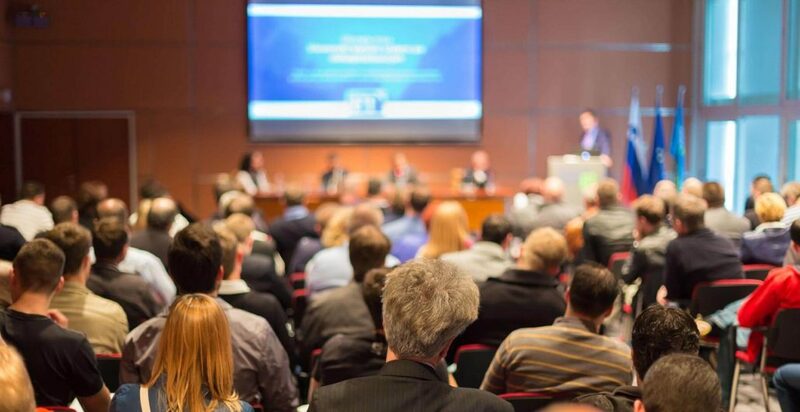 Interpreting services open events to a wider and larger audience, creating the potential for much more success for everyone involved: fellow attendees, presenters, presenting organization, sponsors and more. So as to provide the best service possible it is important to hire experienced and highly-skilled interpreters. Of course we all like a good deal. But when it comes to hiring interpreters, its best to avoid temptation. Interpreters spend years honing their skill set to be able to provide top notch service. So, while a quality interpreter may indeed cost more it will be money well spent. Be wary of quotes from interpreting companies that seem too good to be true. It likely means the agency is not paying their interpreters a decent wage and, as the adage goes, you get what you pay for. Of course, price should not be your only consideration. Consider credentials too. Your clients and event attendees will be able to tell the difference between a quality interpreter and a bilingual person who is functioning as an interpreter. Hiring professional interpreters will reflect well on the event manager and the presenting organization. Professional interpreters, can only work up to their full potential with the proper equipment to assist them in delivering top notch interpreting services. This includes the basics like speakers, transmitters and headsets as well as sound proof booths. The former, so the listener can hear comfortably; the latter both to enhance the service to the listener and be considerate to those at the event who are not listening to the interpreter. These tools are vital as they allow the interpreter to concentrate and focus. A good interpreter may be able to specify what equipment will be needed to best complete a certain job. These kinds of questions are important and will impact how many interpreters should be hired and in what language(s). What language(s) will be spoken by presenters, speakers and facilitators? What languages do attendees speak? When will interpretation services be required and for how long? So as to find specialized interpreters if possible, what subject matter(s) will presenters discuss? Well. . . now that you have interpreting services taken care of, you can get back to that seemingly endless to-do list. 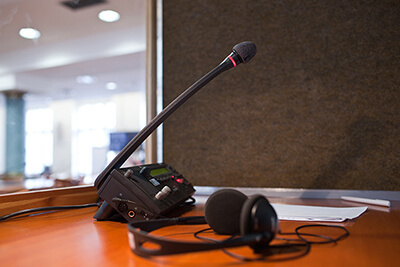 To learn more about CIU’s event and conference interpreting services, please visit https://www.courtcertifiediu.com/conference-interpreters/.